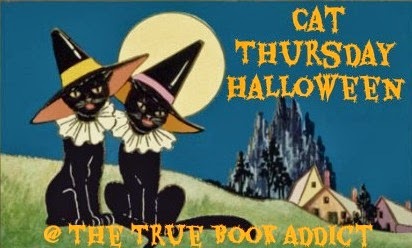 True Book Addict...True to Books: Cat Thursday: Halloween - But Kitty, you must wear a costume! Love all three but the spider web is priceless. LOL love em all. The spider is priceless. OMG, Elle! Too cute. The Poptarts...I almost lost it on that one. He's looking like he's not too sure about the whole thing. Gorgeous cat. Lynx Point Siamese, right? I had a kitty just like him years ago. Her name was Chyna and she was a sweetie and the cutest thing. I miss her. The poor cat wrestling with the webs looks much like Mr. Eccles when he gets a bit feisty during play with the other cats; Drop, roll, hind-claws! Ha ha! I torture my cats with costumes every year just to get a pic! These are great! Yup. You got it! Lynx Point Siamese. He's one of three Siamese in our house (and the most cooperative). We have one other lynx point (who opens doors and flushes toilets and is generally just a pain in the can) and a flame point (who is terribly fat and bawls for food 24 hours a day). He does look like Mr. Eccles! oh my god! Our cats would kill us in our sleep if we tried to put costumes on them! Oh wait, I take that back - our female would rush to the basement where she would hide for days and only appear if we promised to take that torture device off. Not an author I've come across before but given my love of historical fiction I'll be sure to check this out.